Splunk license administration - "This website is not affiliated with Splunk, Inc. and is not an authorized seller of Splunk products or services." Splunk is a free software.You can download and use it for free if your splunk installation is indexing (processing) upto 500 MB of logs daily through it.If your daily indexing volume (size of logs collected by splunk) is more than 500MB and you want to use splunk advance features then you have to buy splunk license. splunk license cost depends on the volume of logs that splunk indexer process in a day (from midnight to midnight by the clock on the license master) . Understanding splunk license and its types will be useful for making core decisions while implementing and configuring splunk .Any host in your Splunk infrastructure that performs indexing must be licensed to do so.Splunk enterprise license starts at $6,000 for a 500MB/day perpetual license or $2,000/year for a term license. It all depends on the volume that you're indexing daily i.e. how much log data you are sending to splunk to process/store. 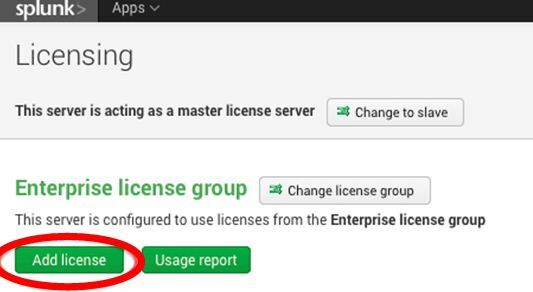 Once you license Splunk Enterprise there is no limit to the number of users, searches, alerts, correlations, reports, dashboards or automated remedial actions. It's all included—at no additional cost. Splunk license estimation | How to estimate splunk license cost for your environment? Estimating the Splunk data volume within an environment is not an easy task due to several factors: number of devices, logging level set on devices, data types collected per device, user levels on devices, load volumes on devices, volatility of all data sources, not knowing what the end logging level will be, not knowing which events can be discarded and many more. As you begin the process of planning and implementing the Splunk environment, understand that the license size can be increased and the Splunk environment can be expanded quickly and easily if Splunk best practices are followed. Below are few recommendation on how to determine how much license is needed. Identify and prioritize the data types within the environment. Install the free license version of Splunk. Take the highest priority data type and start bringing its data into Splunk, making sure to start adding servers/devices slowly so the data volume does not exceed the license. If data volumes are too high, pick a couple of servers/devices from the different types, areas or locations to get a good representation of the servers/devices. Review the data to see if the correct data is coming in or if there is any unneeded data that can be dropped. Make any adjustments to the Splunk configurations needed and then watch the data volume over the next week to see the high, low and average size of the data per server/device. Take these numbers and calculate them against the total number of servers/devices to find the total data volume for this data type. Repeat this process for the other data types listed until you are completed. If you would like to accelerate this process you can work with Splunk or a Splunk partner to get a larger temporary license to do your testing with. By default splunk installation comes with 60 day Trial Enterprise license. This license allows you to try out all of the Enterprise features in Splunk for 60 days, and to index up to 500 MB of data per day.Once the 60 day trial expires (and if you have not purchased and installed an Enterprise license), you are given the option to switch to Splunk Free. Splunk Free includes a subset of the features of Splunk Enterprise and is intended for use in standalone deployments and for short-term forensic investigations. 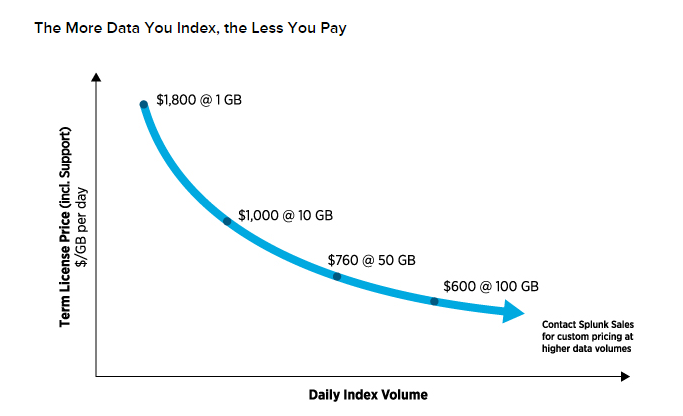 It allows you to index up to 500 MB of data a day indefinitely. Splunk Free does not include authentication or scheduled searches/alerting. This means that any user accessing your Splunk installation (via Splunk Web or the CLI) will not have to provide credentials. Additionally, scheduled saved searches/alerts will no longer fire. How to configure splunk license? |How to install splunk license ? 1. Licensing master - controls one or more license slaves. 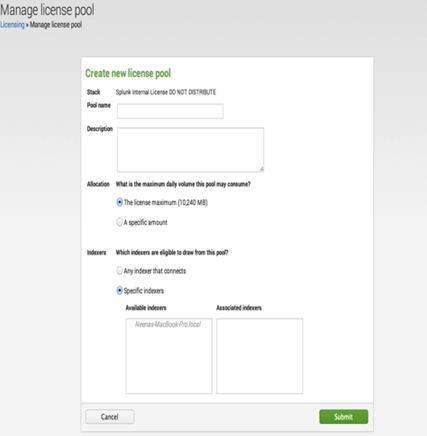 From the license master, you can define stacks, pools, add licensing capacity, and manage license slaves. 2. Licensing Slave - A license slave is a Splunk indexer which is a member of one or more license pools. The access a license slave has to license volume is controlled by its license master. How to add/install splunk license? How to add/configure licensing slave? A group of Splunk indexers configured to share a designated quantity of licensing volume. A pool of indexers is managed by a license master instance. The allocated quantity of licensing volume itself is also sometimes referred to as the pool. How to create a licensing pool? How to mange splunk license usage?